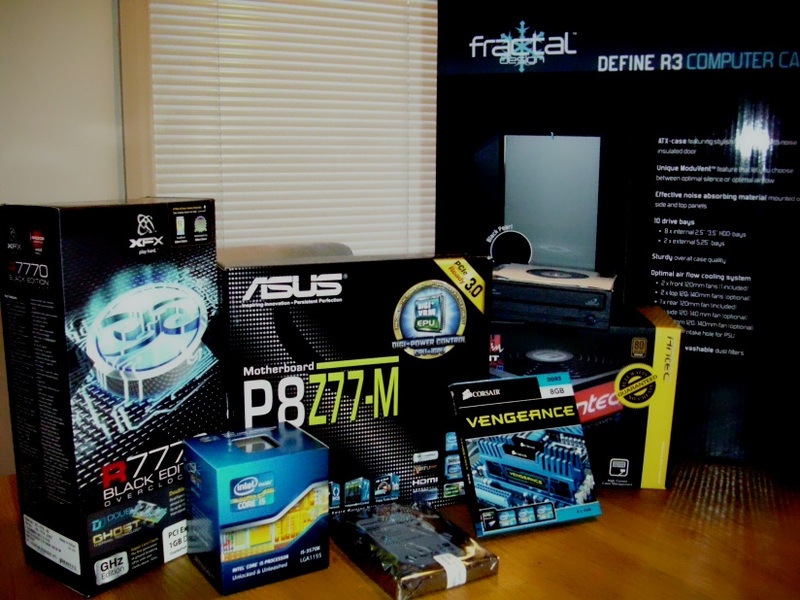 It has been a while since I built a new computer, a few years in fact and I’ve been excited for a few months now since the release of the new Intel 3rd generation core processors “Ivy Bridge”. The Intel Z77 chipset brings some interesting new features and possibilities to enthusiasts also that I wanted to check out. Conscious of budget vs performance I was leaning towards more of the performance end of things, but some sacrifices were made to hit the $900 budget I gave myself. The absence of a boot SSD hit me in the windows performance index score and PC mark benchmarks and rather than going for a Radeon HD7770 based graphics card, I could have gone with a more expensive NVIDIA 680GTX or something but for the price of $149 AUD the R7770 was a great deal. For gaming, heading into the Core i7 real isn’t really required. The core i5 3570k performs very well and is an unlocked (K) model processor also allowing for easy overclocking in the future should I see fit. As I didn’t fork out for a third party cooling solution (such as a corsair H100 water cooling kit) I’m running the machine on air alone. Again, to meet the budget water cooling can come into the picture in the future should any major overclocking come to mind, but for now I’m happy.